This week’s adventures took me to Key West and one of the more remote National Parks, Dry Tortugas. My adventures started in Key West. I walked around exploring for a little while, and I went to the Southernmost Point. I didn’t end up doing any of the museums because everything was pretty expensive, and none of the places had outstanding reviews for the price. It was Lobsterfest when I arrived, so there were street vendors and music all over the place. The atmosphere was nice, but I did end up going to a restaurant for lunch instead of getting food from one of the stalls. 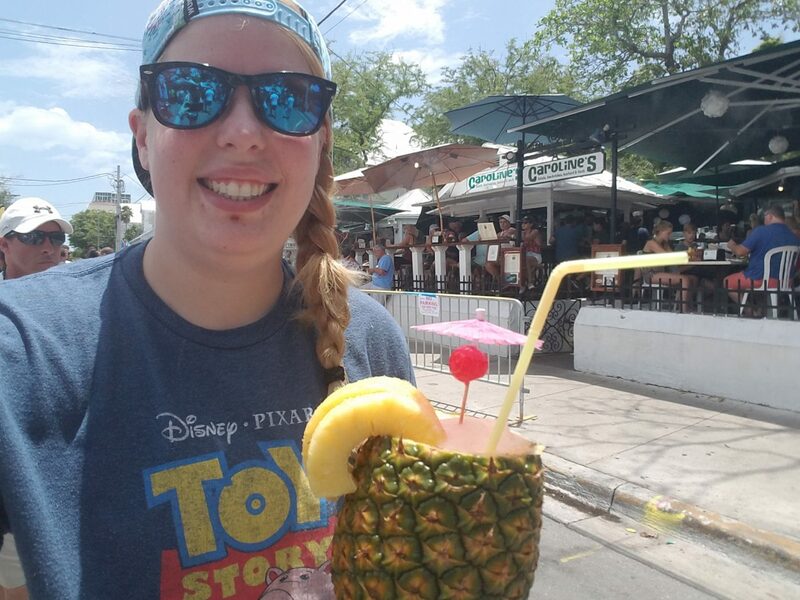 I did enjoy the artsy culture and feel of Key West, but I wasn’t a big fan of the overly touristy and alcohol culture that was also there. Maybe I would have enjoyed it more if I had travelled with friends or if I didn’t have to get up early the next day, but it was not my favorite. My second day of adventures was the whole reason I came to Key West in the first place, Dry Tortugas. Dry Tortugas is a National Park that protects Fort Jefferson and the surrounding reefs and ecosystem. it is well known for good snorkeling and civil war history. The Fort and park are on a little island 60 miles west of Key West, and you can only get there by ferry or seaplane. I had to be at the port to check in for the ferry at around 7am, and we arrived at the island around 10:30. I snorkeled for a while before lunch, and the waters were so much clearer than when I has snorkeled in Biscayne. I didn’t really see any live coral (though I didn’t swim out that far) but there were plenty of fish in the seagrass and along the walls of the Fort. After lunch, I toured Fort Jefferson, which is undergoing some structural repairs at the moment. I did the self-guided tour instead of the guided tour before lunch, and the information for the self-guided tour was more just information about the Fort and its construction as opposed to an actual guide of things to look for. Being up on the fort did provide some amazing views of the surround area which was pretty cool. Overall, the amount of time at the island was a little awkward, and I maybe would plan things a little differently if I ever get the opportunity to go again, but it was still one of the most unique National Park experiences I’ve had.